On the face of it cutting out a whole day of work to boost your business seems an illogical move. Slicing away a fifth of revenue and a shift's worth of labour appears only damaging. Yet head chef Stuart Ralston made the decision in January 2018, closing the doors of his Aizle restaurant in Edinburgh on his third most profitable day of the week. "It's not the ... smartest business choice to shut down your hours when you're at your most popular," he admits to ITV News. It was the loss of his father, a fellow chef, to a stroke which led to him close on a Sunday. Stuart says his dad's death "woke him up" to the health risks of a gruelling industry in which he and his staff had been dedicating 60 to 75 hours a week. He thus chose Sunday to maximise his weekend time with his young son, who'll soon be off to school, and family. Aizle's adoption of a four-day week was met with hostility as word spread. Among restaurateurs, the kitchen knives were out. "I definitely read plenty of things online ... asking if we were going to last or comments like: 'Let's see if he's open in six months' time'," Stuart remembers. General manager Jade Johnston accepts the move was always likely to grab attention. "Cutting off 20% of revenue, even as a member of staff never mind owning the business, doesn't necessarily seem like the best decision to make," she tells ITV News. A year on, the willingness to "take a risk" has been rewarded; Aizle has enjoyed its best financial year, aided by a new seating plan and new kitchen equipment which were both covered by a moderate increase in prices. But Stuart says it's the improvement in staff morale, which has helped to recruit and retain willing workers, which has been the biggest positive. 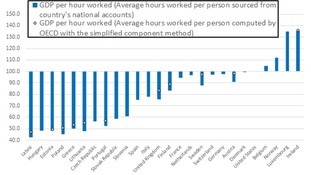 So why don't others reduce their working hours? "I think a lot of people have been used to working a certain way for their whole life," he says. Why do most people work five days a week? 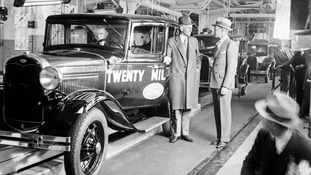 The five day model is often credited to US motor tycoon Henry Ford's proposed switch from a six-day 48-hour working week to 40 hours on the Monday to Friday car production line in 1914. The creation of unions helped to forge it as the 20th Century's working norm to give workers two days' rest - a weekend break which has remained largely unbroken to this day. In fact it was politicians who briefly reduced the working week to three days in the mid-1970s as the ruling Conservatives waged war with coal miners. The measure to conserve electricity was short-lived, though, and Britain was soon back to five days. But recent slumps in productivity have raised the demand for new ways of working in a nation in which one in eight work more than 48 hours a week. The international debate on working models stoked again recently with Chinese billionaire Jack Ma, who co-founded web retail giant Alibaba, again pushing his so-called 996 system: six days of 9am to 9pm working, adding up to a 72 working week. But in Britain the growing demand, led by the political left, is for the nation's workers - who put in the longest hours in the EU - to reduce their hours. How many hours is the nation working? A new study published on Wednesday by the TUC, which advocates a four-day week, found full-time employees work an average 42 hours in the UK. That compares with 37 in Denmark and 39 in many countries, including Holland, France, Ireland, Italy and Sweden. The four-day week has been championed as official policy by the Green Party, while shadow chancellor John McDonnell has backed it as a way to shift the country's work-life balance and improve the nation's production rate. "We work the longest hours in Europe and yet we are less productive," argues the opposition front-bencher. "The Germans and French produce in four days what we produce in five and yet we work the longest hours." What is the productivity gap? While we work more than most as a nation, Britain lags behind the world's leading economies in labour productivity, including our international neighbours. Some four-day week campaigners point to Parkinson’s law, which claims work expands to fill the time available for its completion, as an explanation of how workers in Britain effectively waste a day a week. Figures from the Office of National Statistics in 2018 suggested the so-called 'productivity gap' may be smaller than imagined, but undeniable nonetheless. The estimated labour productivity gaps of selected leading European countries sees the UK outperformed by our many neighbours. Calls for a four-day switch increased after a New Zealand financial services company initiated the four-day-week and claimed it boosted productivity by 24%. Yet the world of business remains largely sceptical of the benefits of losing a working day to enhance output, with high-profile examples of US tech companies reverting back to a five-day week refuelled arguments that it remains the only practical way of modern working. The Confederation of British Industry criticised the political push for a "rigid" four-day format in the UK as "a soundbite but not a solution", while some workers have expressed worry about a loss of income. Ian Brinkley, chief economist at the Chartered Institute of Personnel and Development (CIPD), recently said there was no "particularly strong evidence" that reducing working time automatically improves productivity. But some businesses have made time for a four-day week and sustained the number of hours at the same time. "We're still working the same hours as everybody else," explains Graham Alcott, whose productivity firm in Brighton and Hove made the switch seven years ago. His company, Think Productive, morphed the five-day week into four extended weekdays and one Friday in four after a three-month trial. It ensured the company, which teaches others to make better use of their time, could remain open for business across the week and guaranteed worker pay and holiday remained unaffected. Staff are still given the option to work a traditional five-day week. Most don't, choosing to lose two commutes and gain the freedom of an extra day to pursue personal and professional interests beyond their primary income. It also makes Elena Kerrigan that rare managing director who is happy to switch off from the business on a Thursday evening. "You know that feeling when you're on holiday and you forget about work?" she tells ITV News. "I get that every weekend and I know the staff do as well. I could never imagine going back to a five-day week now." How has the company overcome obvious obstacles? Elena said the four-day switch required more planning through the week and greater staff coordination. Sickness and absences have also taken a greater toll. "If someone is away for two days and they're on a four-day working week then you've lost them for half their week," says Graham. But he believes the benefits of motivated, happy workers outweigh any negatives in changing the way they work. Graham admitted to feeling "quite threatened" by the four-day move seven years ago, back when Think Productive was a UK-only operation. Now it's "the norm" for a company which has expanded to 12 countries. "What we've found over the last few years is that our people don't burn out, we have a really good rate of growth within the business and for me that's because of the four-day week," he says. "It's actually enhanced the business rather than held it back." Think Productive has also used the four-day offer to compete with bigger firms, attracting staff keen to explore other careers or work in family commitments on their third day off each week. "Recruiters say that candidates are expecting it," Elena says. But is it the future for other firms? The TUC argues the impending advances in technology and automation should be used by companies to buy us all more time off rather than be used to simply replace workers. The union wants the four-day week installed in Britain as normal practice by the end of the century. But is it doomed to be defeated by overarching business structures which dictate the way we work? Much is made of famed economist John Maynard Keynes's never-realised prediction in 1930 that his grand-children's generation would enjoy a 15-hour week by the year 2000. But companies are keen to make the move to four days their reality. A picturesque hour-and-a-half's drive north of Aizle restaurant in Edinburgh is the eco-friendly activity hostel and mountain biking centre Comrie Croft, nestled in the southern Highlands. Managing director Andrew Donaldson says the prospect of attracting and retaining staff is driving his interest in adopting the four-day week. "We've love to implement it tomorrow," he tells ITV News, even if the financial books took a hit. "Profits are important but not the only thing," he said. "We want to have as many different positive impacts as we can." So why doesn't Comrie Croft take the plunge? "Welcoming people to enjoy the great outdoors" requires the office to be manned 361 days a year, Andrew explains. Even the remaining days of the year need someone to be on call. His challenge is to find a way to spread out his 15 full time workers and 10 casual staff members a day less a week. The move appears popular with some staff. In the bike shop, mechanic and coach Scott can see how time off could benefit the business, but he also has concerns. "I think you'd be more productive in your job if you were less stressed," he tells ITV News. "(But) if the money wasn't going to be the same I don't think I could do it, as I'm saving for a house." It's a red line for Andrew, who is "committed to not lowering staff pay". But if he can find a way to realign his staff's rota, he hopes to make the change at some point in 2019. Can the four-day week really work for everyone? Back down in Edinburgh, chef Stuart urges Andrew and other business owners to embrace the prospect of change. "It doesn't have to be like the olden days," he says. "There is another way to do it. This is proof that it does work." The restaurant's general manager Jade is more cautious. She says she's "not sure every business can do this" but says for the more "extreme" long-hour industries "it's more important". "In a lot of healthcare professions, a lot of tech professions, definitely the service industry, our hours are not the same. It's not a classic nine to five." For her, the three days off has brought the restaurant's dedicated staff "one step closer to normality". In Brighton and Hove, Think Productive MD Elena urges firms to constantly examine new ways of working. "Of course, every business has its own parameters, needs and goals," she said. "You need to be open to ideas and maybe it's not the four-day week but it's some other form of flexible, agile working. It's the future."